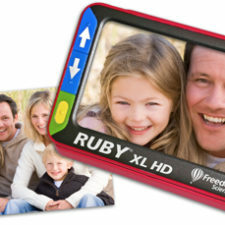 *New Camera* – Ultra HD – Super-Sharp Image! Start with Photos – A tool for the heart. Start with photos…Consider the moment when you look at an image from your past, it is a very emotional and intense experience. Viewing a photo can impact our deepest self with a broad range of feelings and instantaneously bring to mind hundreds of thoughts all at once. Photos have a unique way of bringing to life a distant memory once again in the present day. They have a way of telling an important part of the story of our life. Photos can remind us of a family vacation, a loving spouse, a wedding, our childhood, a forgotten friendship, an important life event, how much we are loved, how all the experiences of our lives come together. Photos can make it all real again, and warm our hearts. 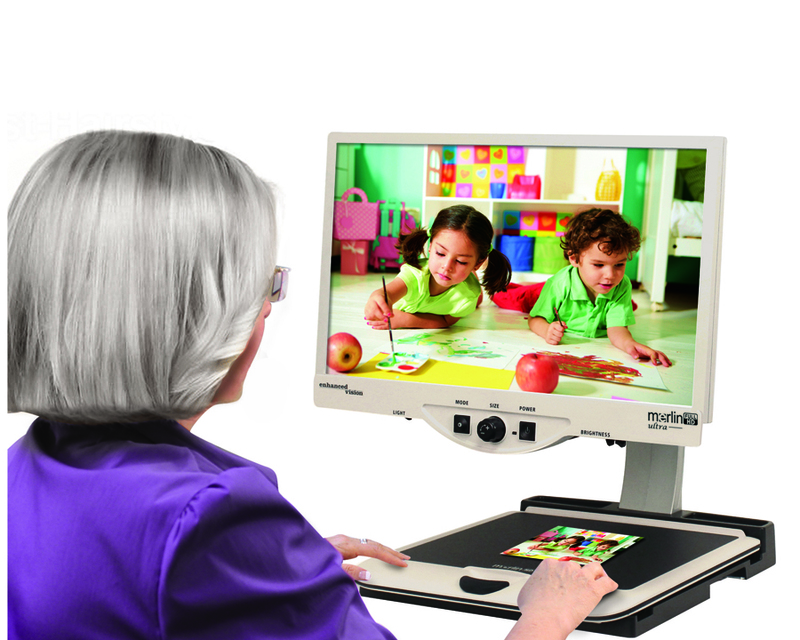 The Merlin Ultra 22″ HD is great for people who want to see photos, and smile. This system has a way of ‘turning-the-tide’ for people who are experiencing feelings of frustration, inactivity, isolation and depression, into feelings of wonder, hope and joy. 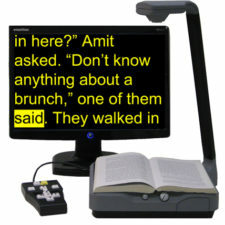 The Merlin Ultra 22″ HD is also for those who consider themselves “technologically-challenged”. 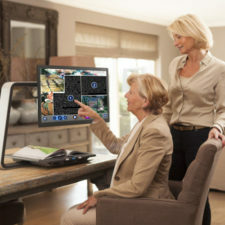 It is very simple to use, and almost 100% of seniors can use this system not only to see Photos, read Newspapers, Mail, Rx, Phone #’s, Recipes, Nutrition Info., Calendars, etc, but seniors also depend on this product for writing. Seniors can write checks and manage their finances, make a shopping list, write a greeting card, fill out forms and so much more. 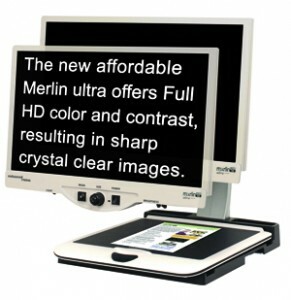 The Merlin Ultra 22″ HD system is a low vision aid that has a remarkably wide 8.85″ viewable field. Why is this important? 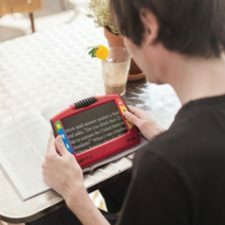 Now, users can see much more on screen, reducing back and forth movement of magnified text, increasing reading speed, reducing fatigue, increasing personal productivity, and most of all, increasing feelings of accomplishment and satisfaction. 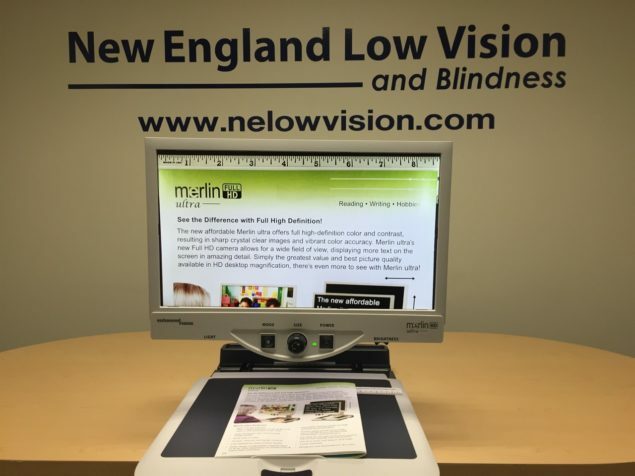 The new affordable Merlin Ultra 22″ HD low vision aid is simply the greatest value and best picture quality available in CCTV or (Closed Circuit Television) HD desktop video magnification. With full high-definition color and contrast, resulting in super-sharp crystal clear images and vibrant color accuracy, contact us today to learn how now more than ever, there’s even more to see with the Merlin Ultra 22″ HD low vision electronic magnification system. It is a tool for the heart. 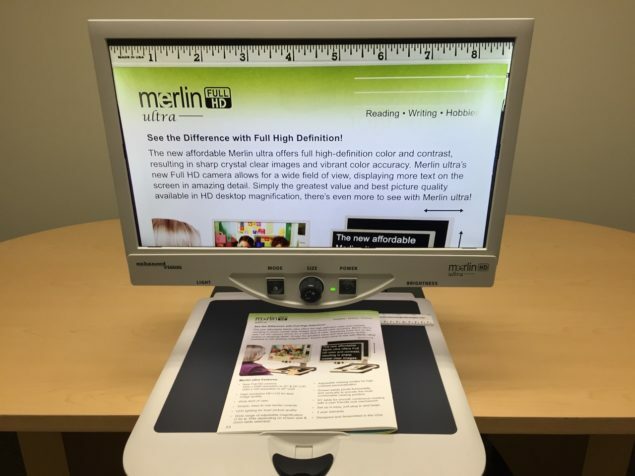 The new affordable Merlin ultra offers full high-definition color and contrast, resulting in sharp crystal clear images and vibrant color accuracy. Merlin ultra’s new Full HD camera allows for a wide field of view, displaying more text on the screen in amazing detail. Simply the greatest value and best picture quality available in HD desktop magnification, there’s even more to see with Merlin ultra! Easily read books and magazines, read and write letters, manage your financial records, view color photos, do crossword puzzles, and even pursue a favorite hobby. 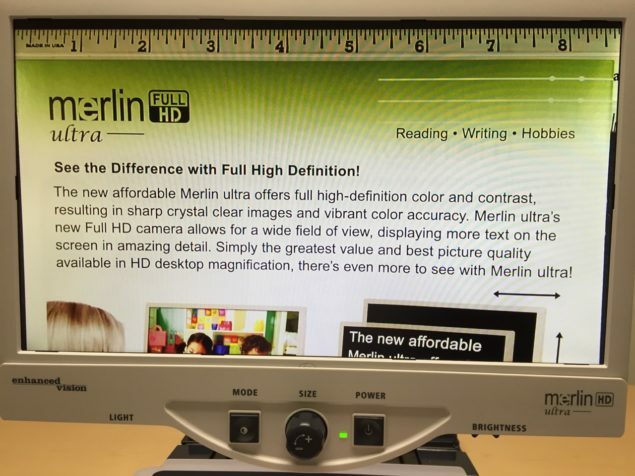 See for yourself what makes Merlin ultra the greatest value and the absolute best picture quality available in HD desktop video magnification. The Merlin ultra with the addition of a HD feature pack, offers the ability of horizontal line markers. These line markers provide a reference point when reading. See the difference today! The Merlin ultra with the addition of a HD feature pack, offers the ability of horizontal windowing. This feature allows you to totally isolate the text you are viewing for complete legibility. New Full HD camera Amazing 1920 x 1080 resolution for 22″ and 24″ LCD models Stunning 1280 x 720 resolution for 20″ LCD models High resolution HD LCD for best image quality Wide field of view General: LCD 20”, 22” or 24” Dimensions: 24”H (maximum) x 20”W x 20”D (61cm x 51cm x 51cm) Operating temperature range: 50-104°F / 10-40°C Storage temperature range: 32-122°F / 0-50°C Monitor: Resolution: 1280 x 720 (20” model) Resolution: 1920 x 1080 (22” model) Resolution: 1920 x 1080 (24” model) Response Rate: 5 milliseconds (20”, 22” & 24” monitor) Contrast Ratio: > 1000:1 (20”, 22” & 24” models) Color Depth: Over 16 million Colors Controls: Light Switch On/Off, Brightness, Magnification, Mode, Power Magnification: 20” LCD: 1.9x (minimum) to 51.2x (maximum) *Zoom range for 20” monitor is based on a 16:9 aspect ratio 22” LCD: 2.1x (minimum) to 55.9x (maximum) *Zoom range for 22” monitor is based on a 16:9 aspect ratio 24” LCD: 2.3x (minimum) to 61.2x (maximum) *Zoom range for 24” monitor is based on a 16:9 aspect ratio *Zoom Ranges subject to change ZOOM RANGE 1 (Default) 1.9x to 51.2x on 20” monitor 2.1x to 55.9x on 22” monitor 2.3x to 61.2x on 24” monitor ZOOM RANGE 2 1.9x to 87.0x on 20” monitor 2.1x to 95.0x on 22” monitor 2.3x to 104.0x on 24” monitor Steps 1-10 use optical zoom. Steps 11-16 use digital zoom.